NAEP’s methodology has kept it above the controversies that have flared over many of the nation’s standardized tests, and it is often seen as the best way to understand how our nation’s schools are progressing. So when the 2015 results give little evidence that the “reform” agendas of the Bush and Obama administrations are bringing the improvements promised, it adds fuel to the debate over whether those approaches need to be changed. For the first time since 1990, the mathematical skills of American students have dropped, according to results of a nationwide test released by the Education Department on Wednesday. […] Progress in reading, which has been generally more muted than in math for decades, also stalled this year as scores among fourth graders flat-lined and eighth-grade scores decreased. 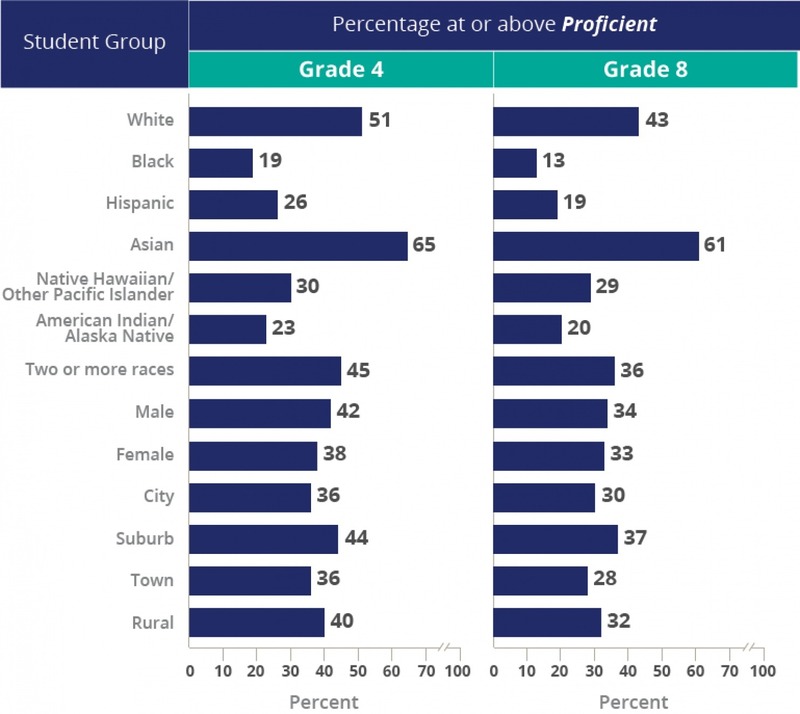 Tests again show large achievement gaps between the nation’s white and minority students as well as between poor and affluent children, an indication that the nation’s disadvantaged students are not gaining ground despite more than a decade of federal law designed to boost their achievement. For nearly 15 years, Presidents Bush and Obama and the Congress have bet billions of dollars—both federal and state—on a strategy of testing, accountability, and choice. They believed that if every student was tested in reading and mathematics every year from grades 3 to 8, test scores would go up and up. In those schools where test scores did not go up, the principals and teachers would be fired and replaced. Where scores didn’t go up for five years in a row, the schools would be closed. Thousands of educators were fired, and thousands of public schools were closed, based on the theory that sticks and carrots, rewards and punishments, would improve education. But the 2015 NAEP scores released today by the National Assessment Governing Board (a federal agency) showed that Arne Duncan’s $4.35 billion Race to the Top program had flopped. It also showed that George W. Bush’s No Child Left Behind was as phony as the “Texas education miracle” of 2000, which Bush touted as proof of his education credentials. Frederick M. Hess, director of education policy studies at the American Enterprise Institute, and Jenn Hatfield, a research assistant at AEI, described the results as a “train wreck” but questioned whether they would actually cause a rethinking of federal directions. While the administration is self-avowedly “data-driven” and convinced that it knows “what works,” it’s not clear what, if anything, might persuade Duncan to rethink his push to federalize school reform or his cheerleading for the Common Core. Happy results are vindication, and poor results are just a sign that change is hard.